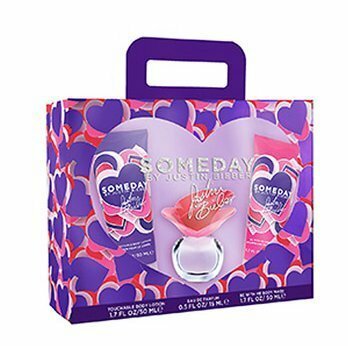 Justin Bieber Someday Fragrance Gift Set for Women: •Includes: Justin Bieber Someday Eau De Parfum, .5 fl oz; Body Lotion, 1.7 fl oz; and Shower Gel, 1.7 fl oz •A playful, flirty, and addictive fragrance •A splash of juicy mandarin, pear, and wild berries •Fresh notes of jasmine and creamy florals •Hints of warm vanilla and soft musk stin Bieber Someday Fragrance Gift Set for Women, 3 pc, is a playful, flirty and addictive fragrance with a sparkling splash of juicy mandarin, pear and wild berries. With fresh notes of jasmine and creamy florals, this Justin Bieber Perfume Gift Set is hard to resist. Hints of warm vanilla and soft musk add a silky-smooth beat that is appealing. 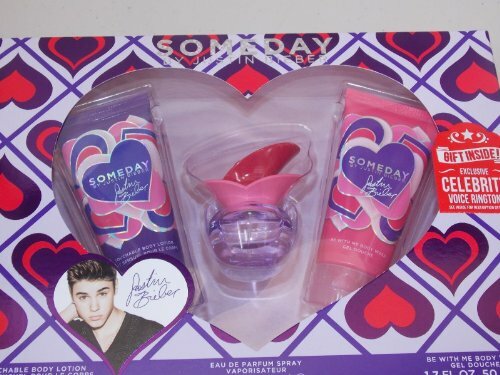 The Justin Bieber Someday Gift Set includes Justin Bieber Someday Eau De Parfum, .5 fl oz; Body Lotion, 1.7 fl oz; and Shower Gel, 1.7 fl oz. This Justin Bieber Someday Fragrance Gift Set for Women, 3 pc, will offer an appealing fragrance for virtually any occasion.